Now this is what I call SNOW! 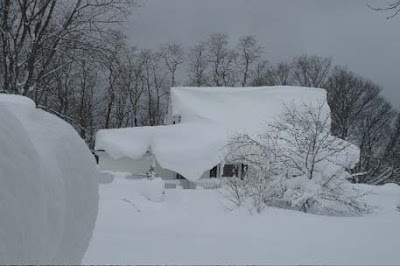 Somewhere in the background of this picture from Mexico, NY is a home buried by the incredible amount of snowfall from this past week. While many of us around here get excited over our 'flurries', I can imagine the folks from Southern New York state are probably a little tired of this heavy stuff. Some places have measured over 70 inches of the white stuff. The weight can collapse roofs. UNBELIEVABLE! We will actually warm up here in the Upper Cumberland region of Middle Tennessee on Monday and Tuesday. Rain will move in, BUT, don't get used to the warm air. Winter will make it's harsh return Tuesday as rain changes back to snow and the rest of the week will be chilly! See you on Cable Channel 7 at Noon, 6:30 & 10 pm for Cookeville News and Weather! that nashvillewx site that Channel 2 runs is very good.